I couldn't wait to finish cleaning the garage, because I knew a much bigger task was ahead of me. Beanie Babies are huge...I mean aren't Beanie Babies the "IT" item that made eBay what it is today? There's a fortune here. I'll sell these on eBay and make a killing. I can retire if I do this right. I can tell the man where to go, what train to take out of town, what bus route doesn't stop at the office, I can quit my job! As I threw the Beanie Babies out of the treasure chest and onto the table a golden pyramid grew before my eyes. 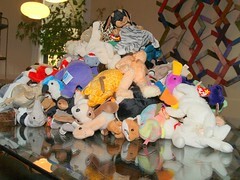 A pyramid of Beanie Babies. The dollar signs started twirling around in my eyes, just like Scrooge McDucks did in the comic books..
"It's too good to be true," I kept telling myself in a half-hearted attempt to reassure myself. There must be thousands of Beanie Babies here, or at least a few hundred. What's that? Are those Beanie Babies in their original unopened cardboard containers? I think it is! Oh my, I've got to sit down and catch my breath.